You can never have too many birthday cards and I definitely don't have enough male cards...this adorable penguin from Sugar Pea Designs is perfect for those masculine cards and comes with a bunch of different sentiments. I used the sketch from SPD as well to create this card. I used my copics, a couple pattern papers and then a C.C Designs star stencil with texture paste on the blue panel. Hi Sharla, I'm a new follower! I saw your adorable card on the SugarPea blog and had to come over and let you know how cute I think this is! Great colors! So cute! I'm loving the bold colours and that penguin is so sweet. Thanks for joining us at Little Red Wagon. Love this cute card! Thank you for joining us at ABC Challenge! Good luck and please join us again! Such a pretty card - your design is just gorgeous. Darling card, Sharla! I love, love, love your coloring! The added white highlights are fantastic! 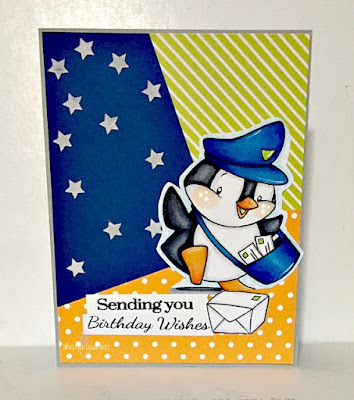 Thanks so much for sharing with us at SugarPea Designs Sugar Sketch! This is adorable! Your background works so well and your coloring is fabulous! Thanks so much for joining us at SugarPea Designs Sketch Challenge.